Momeni, K. (2014). The effectiveness of structured group reminiscence on depression and self-esteem of older women. International Journal of Behavioral Sciences, 8(3), 287-294. Khodamorad Momeni. "The effectiveness of structured group reminiscence on depression and self-esteem of older women". 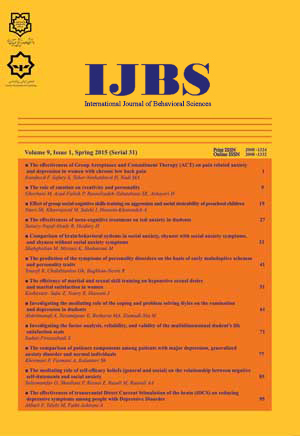 International Journal of Behavioral Sciences, 8, 3, 2014, 287-294. Momeni, K. (2014). 'The effectiveness of structured group reminiscence on depression and self-esteem of older women', International Journal of Behavioral Sciences, 8(3), pp. 287-294. Momeni, K. The effectiveness of structured group reminiscence on depression and self-esteem of older women. International Journal of Behavioral Sciences, 2014; 8(3): 287-294. Introduction: Due to the growing elderly population and the prevalence of the phenomenon of staying in nursing homes, psychiatric disorders in this population have become inevitable. In such circumstances, paying more attention to the non-drug therapies seems necessary.Therefore, the aim of this study is to investigate the effectiveness of structured group reminiscence on the depression and self-esteem of older women.Method: This study is quasi-experimental, pretest-posttest-follow up design with a control group. The population includes all the elderly female nursing home residents in the city of Kermanshah. Among them, 24 elderly were selected and have been randomly assigned to experimental and control groups. Seniors who were in the experimental group received 12 weekly sessions of structured group reminiscence and control group received no intervention during this time. In order to record the score changes, the brief mental status examination, depression among seniors, and Rosenberg's Self-Esteem Scale questionnaires were filled out by participants during the pretest-posttest level and three months after the intervention.Results: The result of the analysis of the covariance indicates the effect of the structured group reminiscence on reducing the symptoms of depression and increasing self-esteem among female seniors. These results were maintained in a three month follow-up only for depression scores.Conclusion: Based on the findings of this study one can once again emphasize the importance of the effect of structured group reminiscence on the improvement of psychological disorders among the elderly.